Children who do daily exercises, mimicking a baby in the womb, have shown dramatic improvements in maths and English, new research suggests. The technique, Primary Movement, has been championed by Dr Martin McPhillips from Queen's University Belfast. Until recently, it had not been formally tested. But the first academic study has startled the sceptics. 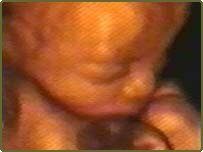 Primary Movement is based on the fact that while they are still in the womb, babies are practising for life outside. They go through a range of movements and reflexes while they are still foetuses, but usually grow out of them by the time they are one year old. However, some never get past the habits formed as a foetus. For some reason, that has been shown to hold back their school work. However, getting pupils to mimic those baby movements every day in class is said to bring astounding improvements. Dr McPhillips, a psychologist who developed the programme, said: "We adapted the foetal movements for school children. "Sometimes we disguised them in songs and dance. The programme is a re-enactment of foetal life." He admitted that it sounded "a little ridiculous". "These are very powerful movements and they are at a critical point in development when so much of the central nervous system for example is being laid down." Many primary schools have tried the movement therapy but, until recently, there had been no formal research. However, a new study has measured the effect of the special daily exercises. Dr Julie-Anne Jordan-Black followed the progress of 1,000 children from 13 schools. "Some children received the primary movement programme, some didn't and they were a control group," she explained. "The results have shown that the children who received primary movement significantly increased their standard score in maths, spelling and reading." Schools involved in the study reported good results. Karen Smyth of Holy Family school in Teconnaught, County Down, is an enthusiast. She reported jumps in standardised scores following the use of primary movement. "We would have seen standardised scores jumping in English from about 93 to over 110, which was massive. "Normally, the child would move two to three points from year to year," she said. "Maths was the same. It went right through from lower ability children to the top of the class." However, before it is introduced across Northern Ireland, Carmel Gallagher from CCEA wants more proof that it really works. "The research is coming through quite strongly that this movement programme has an impact on children's reading age," she said. "But let's make sure that this is the case, can this research be replicated outside Northern Ireland and then, if absolutely proven, I think that CCEA and the Department of Education would be hugely interested in seeing something like this applied right across the education system." The researchers said they had now done that and a study in Australia has been completed which shows similar improvements to those reported by teachers in Northern Ireland. make some comments about the article. What do you think about it? Are you agree with it? Task 1: "Music Lessons for the Brain"
Learn to play the piano. Join your school band or sing in a musical. Take some guitar lessons and start a rock group. If people wonder what you're up to, tell them you're doing something important. You may be making yourself a little bit smarter. A new study shows that young children who learn to sing or play a musical instrument may gain a slight mental edge over kids who don't take music lessons. Taking music lessons may help you become a little bit smarter. The study involved 132 first graders in Canada. 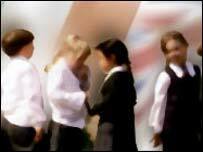 The researchers, from the University of Toronto at Mississauga, randomly divided the students into four groups. One group took weekly piano lessons. Another group took singing lessons. The third group went to drama class. And the last group did no extracurricular activities for the entire school year. All the participants took IQ tests at the beginning and at the end of the first grade. Overall, average scores went up for all groups. But kids who took piano or singing lessons gained more. Their IQ scores went up 7.0 points on average, compared with 4.3 points for kids in the other two groups. It's a tiny difference, really, and the music students probably won't end up getting higher grades or having greater success later in life. Still, the results are worth noting, the researchers say. 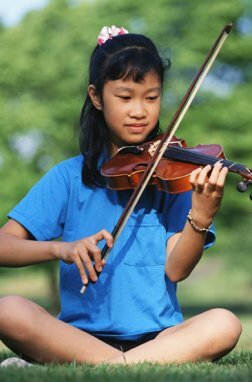 Learning to play music teaches kids how to pay attention and memorize things, and it helps fine-tune coordination and other physical skills. These types of experiences may have positive effects on the developing brains of young people. - Have you learnt to play any musical instrument? Which one? - Are you agree with this article? Welcome students of this elective class of Communicative English. The main objective of the class is to increase your English developing the four basic skills: Listening, Speaking, Reading and Writing. It's not an easy job, because we have only three hours a week to work in the classroom. This year a part of the final evaluation of the class will be based on the use of this Blog, your blog now. Every week will appear an article that you'll have to read and then to make some comments about it. The objective is to develop your reading and writing skills as maximum as possible. Your comments shouldn't be too long but sincere and from your own creation. Apart from the articles I'll upload the handouts used in class, some photos and other interesting stuff realted to our class. Well boys and girls, good luck and let's start.